Get to know Ho Chi Minh City, or Saigon as it is still known to its millions of inhabitants, one of South-East Asia’s most frenetic cities. Ho Chi Minh City’s (HCMC) Tan Son Nhat international airport is just eight kilometres from the city. The cheapest and most convenient way to get to the city is by taxi; it should cost around $10. Drivers might try to offer a higher set fare, but always ask to turn the meter on and use the Mai Linh (white and green) or Vinasun (white) taxi companies as they are the most reliable. The sites in HCMC are predominantly located within District 1, which means you can see most of it by foot. You could easily do Notre-Dame Cathedral, the Central Post Office, Reunification Palace, War Remnants Museum and Ben Thanh Market in one day. Getting around the city by taxi is reasonable. It’s around 60 cents for flag fall and 20 cents per kilometre, so a trip from Thien Hau Temple to The Independence Palace (about five kilometres) will cost you around $2. Saigon’s traffic is a chaotic sea of bumper to bumper motorbikes. We don’t recommend hiring one on your own, but if you want to see Saigon on two wheels, try a guided tour with XO Tours, an all-female motorbike company whose four tours cover major sites, street food, the city by night or the best shopping spots. What better way to get around than by the iconic cyclo? Sadly these three-wheeled bicycles are vanishing from the city, but if you come across a friendly cyclo driver while wandering around District 1, hire one for around $3 to $5 for an hour. Said to be the oldest house in HCMC, the Archbishop’s Palace was built in 1790 and is one of the best examples of French colonial architecture in the city. Despite being relocated several times since it was first built (it now sits in the French Quarter) the original structure, with its tiled roof, carved wooden doors, beams and pillars, has been around for around 200 years. A fantastic place to people-watch, particularly in the early morning between 7am and 9am when groups of elderly gentlemen bring their pet birds in cages to ring out a collective morning symphony. The park itself is 10 hectares of green space, with benches and pathways under shady trees – an ideal spot to cool off from the midday heat. You’ll also spot many locals here exercising, or heading to and from the Workers’ Club, home to a clubhouse, tennis courts and an Art Deco pool. You haven’t done HCMC until the fat lady sings. You may walk by the Opera House on your travels, but we recommend heading inside the glorious French-style building and seeing a performance. It hosts a variety of classical and contemporary performances throughout the year, from opera and ballet to rock concerts. This is Ho Chi Minh’s bustling central market. Pick up souvenirs, clothing, jewellery, hardware, sweets, fruit and veggies, spices… you name it, it’s here. Haggle to your heart’s content (except at the stores with ‘Fixed Price’ signage). The city’s biggest mall is divided into two buildings, with everything from Jimmy Choo to Mango, a host of eateries, a huge games centre – bumper cars, air hockey and the like – and a kids’ section called the Fairy Garden. Home to the Notre-Dame Cathedral, the Central Post Office and the Opera House, this street runs for about six blocks and boasts HCMC’s more upscale and boutique shops. But it’s also a great strolling street with plenty of restaurants and cafés to stop at. 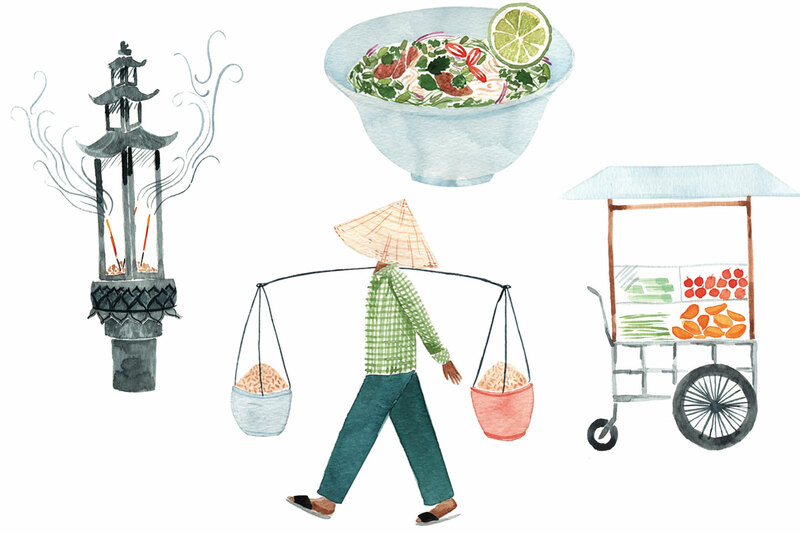 You’ll find street vendors everywhere in Saigon. One of the best grab-and-go options is Bánh mì, a fresh baguette usually filled with pork or chicken, with chilli, pâté, cucumber, thin strips of pickled carrots, white radish, fresh coriander and a sprig of spring onion. Delicious! Since its introduction by French colonists in the 19th century, coffee has become an everyday staple for Vietnamese. In particular iced coffee (‘Ca phe sua da’) – which some liken to melted coffee flavoured ice-cream. 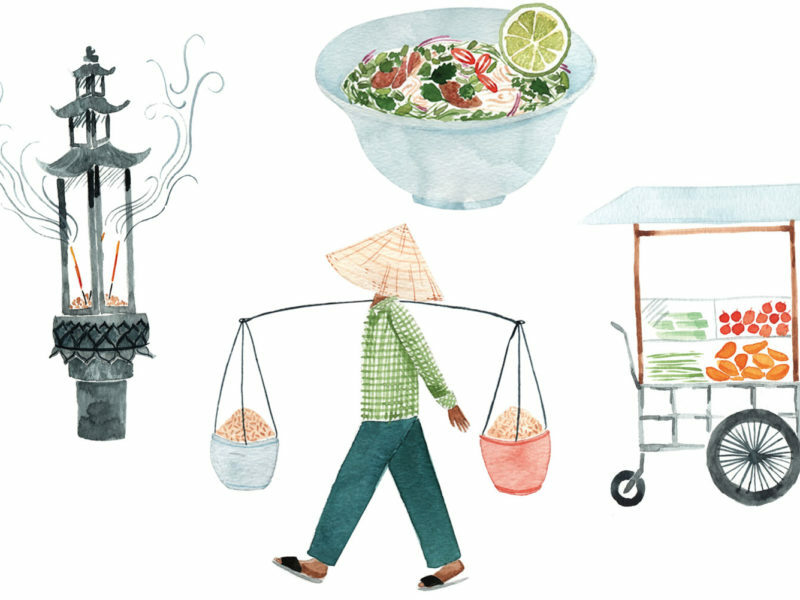 Vietnam’s unofficial national dish can be eaten for breakfast, lunch or dinner. Popular places to try it include Pho 2000 (near Ben Thành Market), Pho 24 (spotted in several locations around the city), Pho Le and Pho Hoa. Or just stop by a street vendor! Try Hoa Túc in District 1, a modern Vietnamese restaurant in a beautiful Art Nouveau setting – they also do cooking classes; Cuc Gach Quán, a delightful family restaurant in a restored French colonial villa (the Jolie-Pitts have dined here); and the hip riverside restaurant/bar The Deck has a great courtyard, daybeds and a top cocktail and wine list – worth the 20-minute drive for a change of scenery. District 1 is the place to be, home to sites such as Reunification Palace, Central Post Office, Ben Thành Market and the Jade Emperor Pagoda. This hotel is just a 10-minute walk from the Opera House and even less to Vincom Shopping Center. It has a funky Japanese-meets-Vietnamese design; each room is vibrantly styled and spacious. There’s a rooftop jacuzzi pool with a bar, a lobby lounge and a Japanese sushi restaurant. This hotel is superbly located, just opposite the famous Ben Thành Market, a fantastic area for walking. The hotel itself is contemporary and elegant with two restaurants, two bars/lounges, a bakery/café, an outdoor swimming pool, a tennis court, gym and day spa. Possibly the city’s most iconic hotel, the Caravelle is located on Dong Khoi Street, within walking distance to the Opera House, Notre-Dame Cathedral and the Central Post Office. Built in 1959, the hotel was home to many members of the International Press Corps during the American War (it has bullet-proof glass! ), with most of their work taking place at the 10th floor rooftop bar, now known as Saigon Saigon. There are two other bars, two restaurants, a café, day spa, pool and gym. Just a short stroll from the Notre-Dame Cathedral, the InterContinental is located between Nguyen Hue and Dong Khoi streets. The modern rooms are spacious with floor-to-ceiling windows and fantastic views over the city. The hotel has three restaurants – Asian and Italian cuisine – and two bars/lounges. ‘How much?’ = Bao nhieu? ‘Where’s the… toilet?’ = Nha ve sinh… o dau?